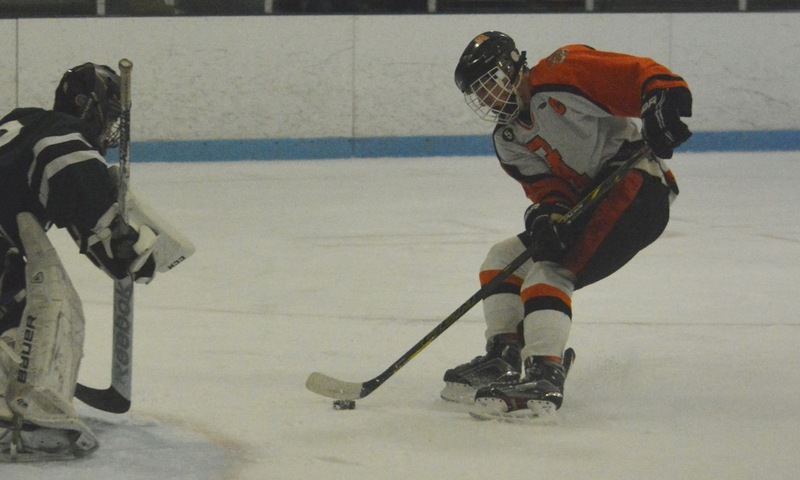 Mansfield, 2 @ Oliver Ames, 4 – Final – Cullen Gallagher (Owen Gallagher, Eric LeBlanc), Matt Mancini (PP – Brett Williams, Owen Gallagher), Jack Maloney (Jared Costello) and Max Ward scored for Oliver Ames. Franklin, 13 @ Attleboro, 0 – Final – Ryan Hohmann netted his first career hat trick and seniors Jake Downie and Alex Bissanti each scored a pair of goals. Tyler Oakes, Jack Chaffee, Sean Hedvig, Luke Downie and Jeremy Miller each scored once for the Panthers. 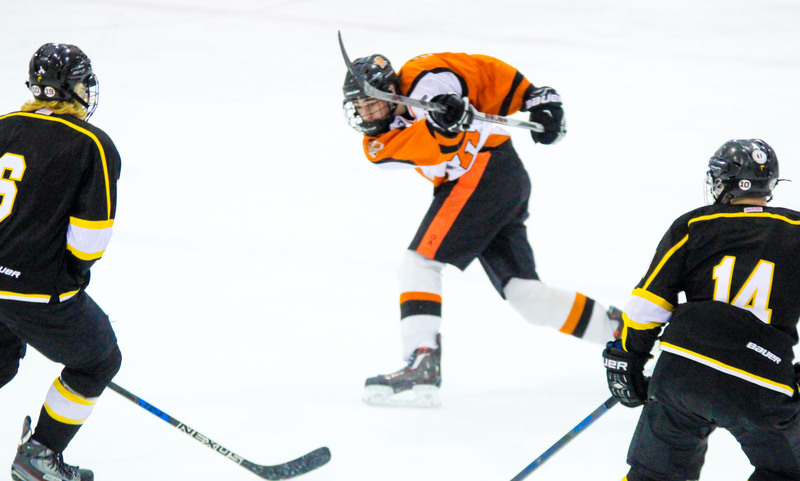 Oliver Ames, 6 @ Foxboro, 0 – Final – OA senior Matt Mancini scored a hat trick and Max Ward, Jack Maloney and Connor Howe each scored once for the Tigers. Zach Walsh picked up his second shutout of the season in net. 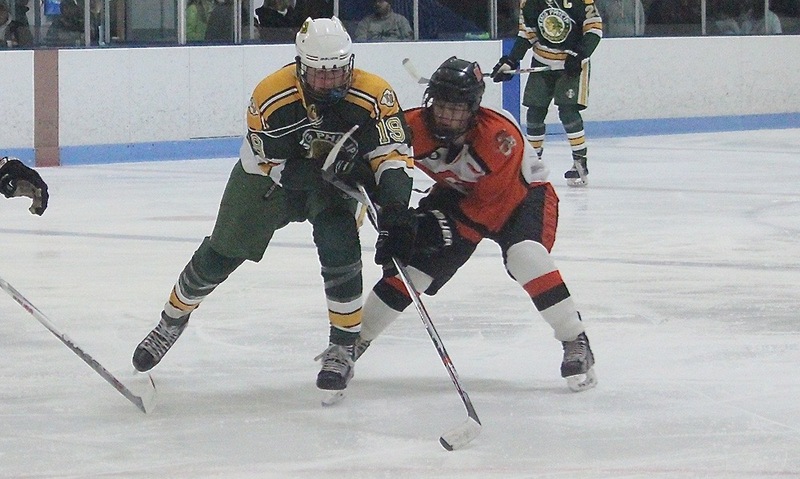 Mansfield, 1 @ King Philip, 1 – Final – Matt Farragher scored a power play goal to put Mansfield up but Kyle McCarthy responded with a power play goal to even the game. BROCKTON, Mass. – For the past four years, Oliver Ames has been the team that manages to steal a point or even two by turning to its goalie for a big performance. With Jimmy Tierney in goal, the Tigers could be outshot but still have the chance to win the game. On Wednesday night at Asiaf Arena, OA got a taste of its own medicine. The Tigers had a 42-18 advantage in shots against Dartmouth only for the Indians to pull out a 3-2 victory thanks to the heroics of senior goalie Tyler Martin, who made 40 saves including one on the doorstep with fewer than five seconds remaining. Eric LeBlanc got the Tigers on the board early in the first period. The sophomore forward finished off assists by Jared Costello and Cullen Gallagher. The lead lasted until 6:56 left in the period when Dartmouth got on the board through Tyler Serpa who followed up a shot by Colin Serpa and smacked in the rebound after Zach Walsh had made three straight saves. The game stayed tied into the final minute of the first when Garrett Silvia won a face-off in the attacking zone for Dartmouth and then followed up a shot from the point to again score on a rebound and make it 2-1. Homer said, “That was a big goal in the game. Our weak side forwards didn’t crash down and take care of business at the net. The momentum swing at the end of the period did not carry over to the second. OA outshot Dartmouth 14-5 in the period and had three good chances inside the opening two minutes that martin was able to keep out, in particular a glove save that robbed Collin Bourne after a great pass by Ben Litwack. Two minutes later and the Indians doubled the lead. A quick transition caught the OA defense flat-footed with Scott Shorrock finding space on the left wing and he sped past the last defensemen for a breakaway and just snuck the puck under the pad of Walsh for a 3-1 advantage. The third period fell into a similar pattern with Oliver Ames pressing for a goal to get back into the game and Dartmouth trying to sneak players behind the defense and catch the Tigers in transition with quick outlets. With just under five minutes left in the game, Martin pulled off a ridiculous glove save to bat aside a chance by Matt Mancini from the edge of the crease. The goalie was prone after making two blocks but somehow managed to get his arm up to knock the shot to the corner. Seconds later, Mancini got his revenge on a breakaway. He deked and dragged the puck to the fore hand before sliding it through the five hole to make it 3-2 and give the Tigers hope of snatching a point. The Tigers kept pushing and Martin kept denying them. 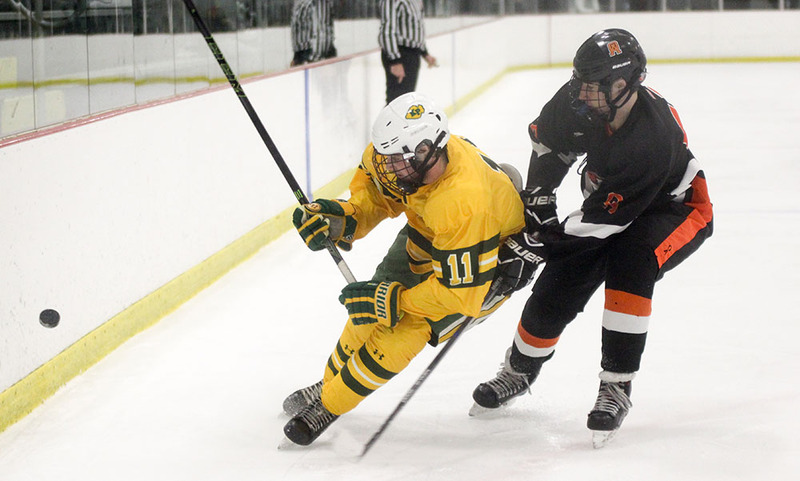 Junior defenseman Jack Maloney had a pair of blasts stopped with no rebound and with the final seconds winding down OA had one last chance from close range on a rebound but again Martin found a way to get a shoulder on it and keep the puck out of the net. Some of the scrappy play can be attributed to having such a young roster and also having only played two games this season and coming off an 11-day break. The Tigers will get another week before game three, when they host King Philip in a non-league meeting.